Problems with healthcare seem to be getting quite a bit of press, but one significant problem may not be receiving enough attention. This is the challenge of having a high population of overly-stressed doctors. Understanding the stress doctors face and how it affects them can help us to understand behind-the-scenes factors that doctors deal with, and raise awareness of their heavy levels of stress. Perhaps even more importantly, looking at the effects of stress faced by doctors and understanding that doctors are neither immune to stress or always completely adept at handling the stress they face, can shine a spotlight on the importance of being proactive about our own stress management rather than waiting for someone else to tell us how to manage our stress or even that we need to do so. Finally, focusing on the job factors that create the most significant stress and the way that this stress can be managed can not only help the doctors who may be reading this but anyone who works a job that is stressful, particularly one that is stressful in the ways that doctor’s lifestyles can be stressful. Understanding the sources of doctors’ stress, the effects of this stress and the ways that this stress can be more effectively managed can help doctors and patients alike. We are often told to talk to our doctors when we face stress that feels too challenging to handle, and this is good advice. Doctors have medical training so they understand the causes and effects of stress and can point us to health resources and plans to manage stress. They may also be quite adept at handling stress, but this isn’t always the case, and the stress that many doctors face is far beyond basic run-of-the-mill stress. One study found that the proportion of doctors experiencing "above threshold" levels of stress is 28 percent compared to the general population, 18 percent of whom experience this level of stress on the job. Another study by AMA and The Mayo Clinic found that doctors work an average of 10 hours more per week than the average population, experience emotional exhaustion at higher rates (43 percent versus 24 percent of the general population) and experience burnout at significantly higher burnout rates (49 percent versus 28 percent) and lower life satisfaction rates as well (36 percent of physicians reported being satisfied with their work-life balance, compared to 61 percent of the general U.S. working population). Another Medscape survey reported that physicians in 26 or 27 specialties rated their burnout levels as a "4" or higher on a 1-7 scale and that nearly 60 percent of emergency room physicians felt burned out in 2017 up from 50 percent in 2013. This problem can be difficult for doctors to cope with, but it can also affect patients. Another group of studies found that doctors who are more stressed have higher rates of medical malpractice claims, and hospitals with more stressed doctors have higher rates of malpractice claims as well. 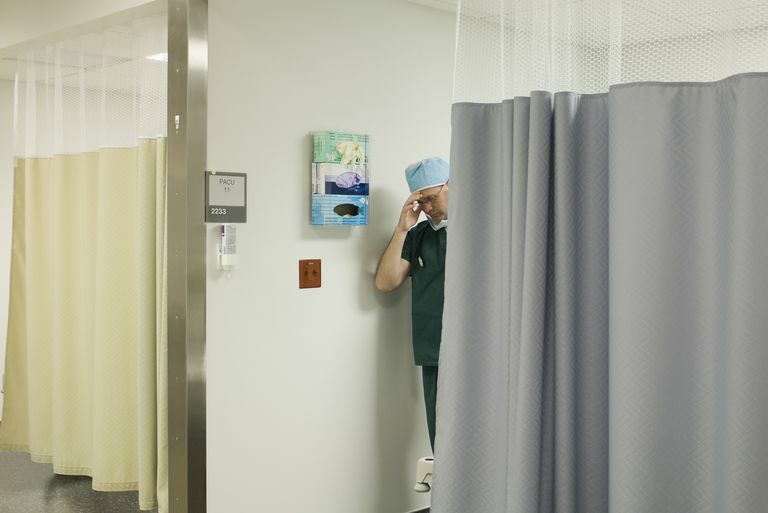 Long Hours: Doctors work many hours, and these tend to be stressful hours. Their shifts are long and filled with strenuous activity. They are often on-call even when not on duty so they may live with the feeling of always being on duty. This can make leisure time feel less relaxing and contribute to an experience of chronic stress. This also means that weekends may feel less restorative. These are some of the prime risk factors for job burnout, which explains why so many doctors experience it. High Stakes: Another burnout risk factor is the feeling that mistakes are risky—that real and lasting damage can come from a small mistake at work. Most jobs contain a degree of this—it’s never a great idea to make a mistake at work—but in many jobs, it’s okay to make some mistakes, and rare to do everything perfectly. In the life of a doctor, any mistake could be a mistake that is remembered for years, a mistake that ruins lives. This small margin of error and high level of consequence for imperfection can lead to heightened stress and anxiety. This means that if they make a mistake and the consequences are heavy, this mistake can be haunting; it also means that the fear of making a mistake can lead to a heightened sense of anxiety. Either way, the toll is heavy and the push to be a perfectionist is strong. Perfectionism: Doctors can face a risk of maintaining a perfectionistic attitude in their lives for the reasons just discussed. While this type of thinking can simply be part of the territory for doctors, it can also be damaging in ways that aren't always recognized. Perfectionists are people who will beat themselves up over receiving a low A on a test when a high achiever with a healthier outlook may rightly congratulate themselves for receiving an A in the first place. Over time, perfectionists tend to be far more stressed and even perform more poorly because of this stress—the stress of never quite being enough. They may also succumb to procrastination and burn out more easily as well. Another layer of difficulty that doctors face is the perception that they must have all the answers, that they should be infallible. If they talk to their colleagues about the stress they face or feelings of burnout, this shows a perceived weakness that many doctors don’t want to show. Out of fear of professional or personal ramifications, many doctors don’t discuss the challenges they face or seek help themselves when they may need support with managing stress. This lack of support can take away a line of defense against stress that doctors sorely. Emotionally Draining Situations: The need to face emotionally loaded or draining situations on a regular basis is something that doctors face constantly, and another job factor that puts people at an increased risk for burnout. They need to deal with patients who may be upset or scared, patients who are angry, and they must break the bad news to patients and their family members can be particularly taxing for compassionate doctors, and this constant part of the job can take a heavy toll. Unfortunately, doctors are expected to deal with these emotionally heavy situations with grace and compassionate support, then go directly to the next patient (and the potential for loss) without slowing their stride. This requires a strong level of self-compassion and a supportive network for doctors themselves, but even with those factors in place, the emotional toll of being a doctor can be a big one. Other professions that involve emotionally challenging situations as a regular part of the job may also be at risk for burnout. Lack of Choice: Doctors can’t usually take a day off if they feel that they’re approaching a state of burnout. They can’t go on vacation and leave their phones off, most of the time. They don’t always have a high level of choice in their day-to-day lives, and this can be stressful as well. Jobs with a higher degree of autonomy—jobs that allow people to choose how they spend their time or freedom in structuring their schedule—tend to be less stressful jobs, but doctors often have their schedules dictated to them with unexpected surprises often appearing as well. Even the choice to be in the field is one that can feel like less and less of a choice—one study found that nearly half of doctors would quit being doctors if they felt it was a viable option for them. This lack of choice can feel particularly stressful. Little Support: Doctors face the kind of stress that is less common in a job, and they maintain a promise of confidentiality with their patients, so it may be more difficult to talk about the challenges of their job and their day. For one thing, they’re not able to share everything. But another factor is that their loved ones can’t always relate. This can make it difficult to find social support in the same way that many people find it. We all need doctors to be at their best, including the doctors themselves! Whether you are a doctor facing stress, an interested party, or someone who has a stressful job looking for stress relief techniques and lifestyle changes for the highly stressed, there are several things you can do to maintain a less stressed existence, build your resilience, and manage stress more easily—without leaving your profession. Consider the following. Minimize Stressors Where You Can: While not all types of stress are harmful, too much stress overall can take a toll and lead to chronic stress. This means that the stress of something exciting like a major trip or even a weekly volunteer job can add up. This also means that the stress of the little things in life—losing your car keys, dealing with a messy home, enduring a draining friend—can also add to the overall stress in your life. (Life coaches call these little stressors “tolerations” because they take work to tolerate.) Getting rid of them wherever you can leave you with more time and energy to devote to things you enjoy and can leave you with more energy to handle the stress you face at work. Find a Supportive Network: Social support really helps with stress, especially the right kind of social support. If you feel that your life doesn’t contain enough of this, it’s important to make a change. You can find more people to create strong relationships with. You can work on strengthening the relationships you do have. You can also join a support group or talk to a therapist; these things can be really helpful for stress management. If you find yourself uncomfortable talking about the stress you feel because you’re afraid of “showing weakness,” this is all the more reason to explore and alter those feelings so you’re able to receive support rather than just giving it. Engage With Patients Collaboratively: In the past, doctors were expected to have all the answers, but with the rise of the internet, many patients come in with answers of their own. This can often create more stress and work if patients don’t have accurate information, but it also shows a willingness to be a partner in their own care, which is something that can be encouraged. Many doctors find that talking to patients, telling them what they can do in their lives to improve their health and well-being, enlisting their participation in their own care. This can actually take pressure off of both parties, in the long run, empowering patients and sharing some of the burdens of responsibility for patients’ health. Accept That Mistakes Will Be Made: It is impossible and unreasonable to expect a doctor, as a human being, to never make a mistake, but that’s the pressure that we all often put on ourselves, and those around us can sometimes contribute to this expectation. These strategies for managing perfectionism can help with the important goal of accepting that you will make some mistakes, but that your best is not just the only thing people can reasonably expect, but that it is enough. If you make a mistake, know that you did your best and then let it go and continue to do your best. This may take practice and is a goal that we always move toward, but it’s also important to remember. Practice Extreme Self-Care: One of the most stressful aspects of being a doctor is that you may not have enough time to take care of your basic needs, and if you don’t, you may be more stressed and less effective on the job. If you haven’t already, you need to become ruthless in meeting your own physical needs: getting enough sleep, enough exercise, enough healthy food, and enough activities that can help you to manage stress. Because this is a recipe for overall wellness, when you learn how to master the obstacles that keep you from meeting your self-care goals, you can use this information to help your patients overcome the obstacles that stand in the way of their health-supporting activities as well. In other words, focusing on self-care and stress management can help you to relate to the challenges your patients face and learn to overcome them so you can better help your patients to do the same. Practice Meditation—In Whatever Form: There are many effective forms of meditation, and they all help with stress management. The important thing to remember is that the best type of meditation is the type that you will be comfortable practicing regularly. If you don’t already meditate, this is a habit that can help you to detach from the stress around you when you need to—something that is vital for doctors. It can also help you to build resilience to stress. You can try a daily prayer, a gratitude journal habit, a loving-kindness meditation, or a bath meditation at the end of the day, and they will all help if you simply practice on a regular basis. Do Three Things to Lift Your Mood Every Day: Research on resilience and positive psychology has found that lifts to your mood can broaden your perspective and help you to build resilience in multiple ways. Perhaps the best part of these findings is that doing something as simple as getting an ice cream or writing in your gratitude journal—things that put you in a better mood—can bring lasting benefits in the way of personal resilience. Learn how this works and make it a simple and fun part of your daily routine. Being aware of the stress in your life and creating a proactive plan to manage it can help you to transform your experience of stress, particularly if you are a doctor. Doctors experience high levels of stress and may have fewer support resources in place. This is why meditation, social support, and other aspects of stress management are so important for doctors. Note: Many policy changes can and should be made to minimize stress and maximize personal resilience in doctors. However, this article is primarily aimed at what the doctors themselves can do for stress management and personal balance, and what we can all do if we find ourselves in stressful jobs and life situations. Jones JW, Barge BN, Steffy BD, Fay LM, Kunz LK, et al. Stress and medical malpractice: Organizational risk assessment and intervention. J Applied Psychol. 1988;4:727–735. Parks, T. (2017). "Report reveals severity of burnout by specialty." AMA. Vassar, L. (2016). "How physician burnout compares to general working population." AMA. Wong, J. (2008). Doctors and Stress." Medical Bulletin, Vol 13(6). What Type of Medicare Provider Is Right for You?